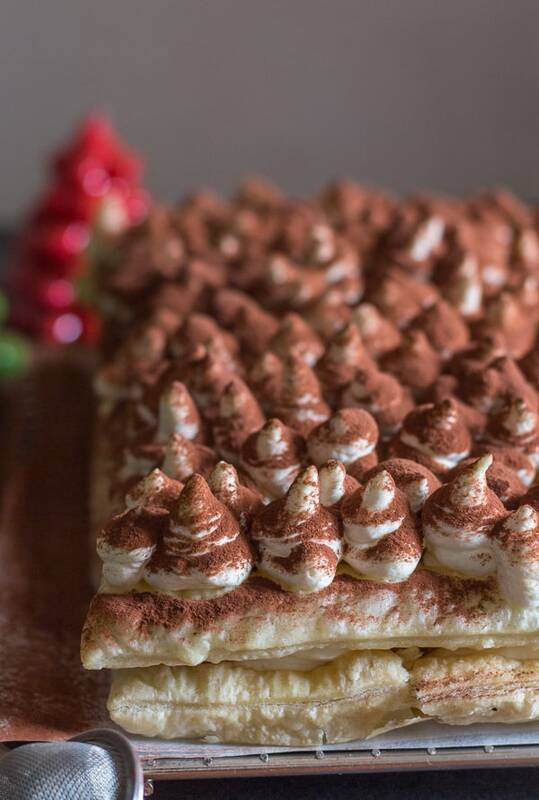 Easy Puff Pastry Tiramisu the traditional creamy Tiramisu filling layered between puff pastry and coffee dipped lady fingers. The perfect holiday dessert. 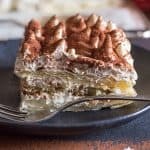 Easy No Bake Puff Pastry Tiramisu is one of the desserts I chose this year for my birthday cake! 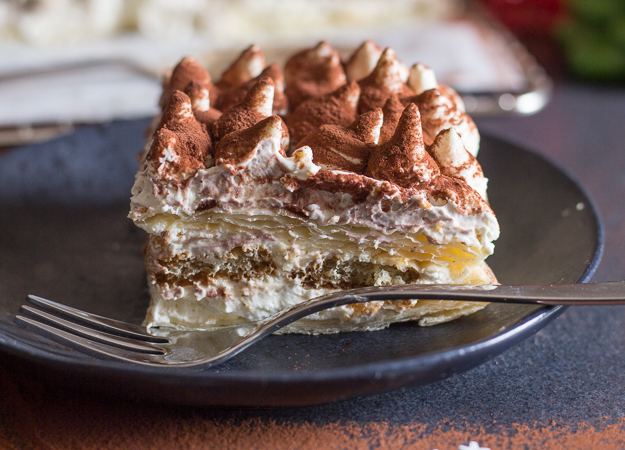 I love Tiramisu, maybe not as much as the Italian but pretty darn close. 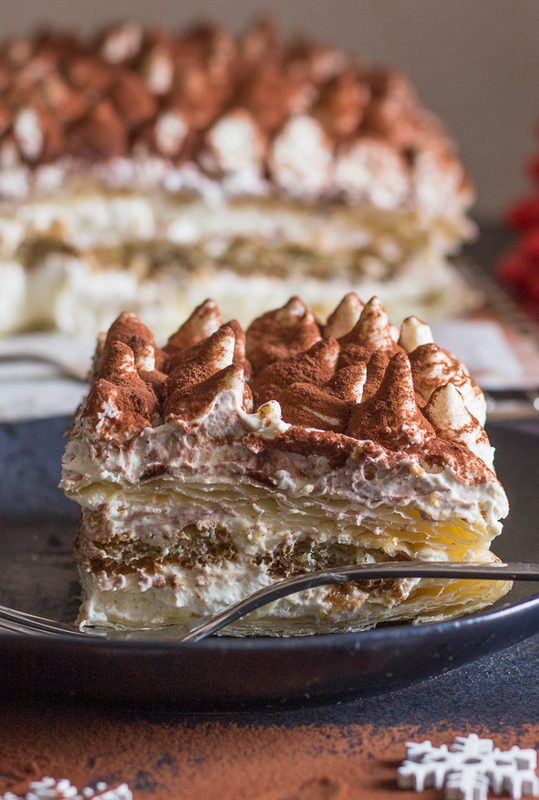 More Tiramisu Recipes you may enjoy! I had an extra package of puff pastry in the fridge and decided that I would make everyone happy and make something Tiramisu. I also had some Lady Fingers left over from making my No Bake Tiramisu Truffles so I dipped them in coffee and that became my second level. With of course that creamy mascarpone filling. I make my tiramisu filling the traditional Italian way and yes I add an egg. You could either leave out the egg or buy a pasteurized egg and go Italian! And of course you can’t leave out the sprinkle of unsweetened cocoa on top. which will be released in the Fall of 2018. It was super yummy too! 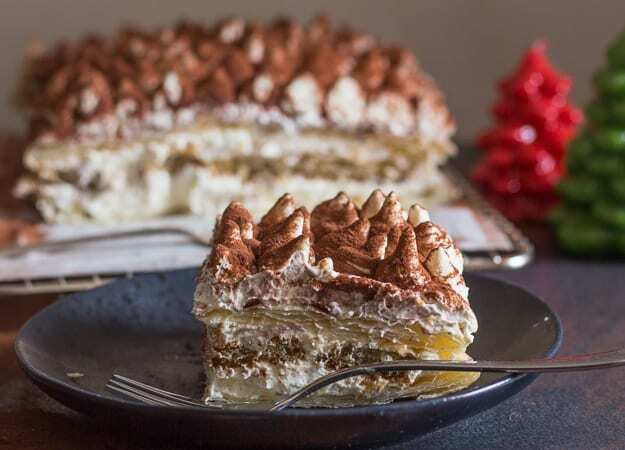 With all the Christmas preparations, the turkey (or whatever you serve), the side dishes, the mashed potatoes and veggies, it’s nice to have a No Bake Tiramisu made with pre made puff pastry and lady fingers. Enjoy! 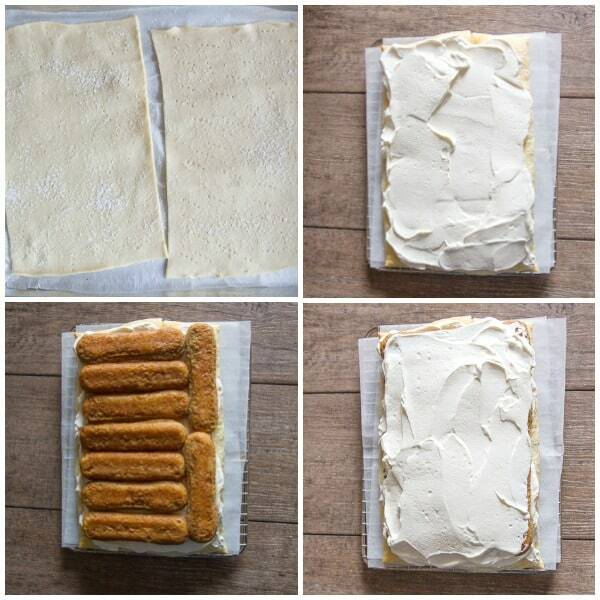 Easy Puff Pastry Tiramisu the traditional creamy Tiramisu filling layered between puff pastry and coffee dipped lady fingers. The perfect no bake holiday dessert. While puff pastry is cooling, in a large bowl beat together until very thick the mascarpone, cream and sugar (I always add a pasteurized egg as per the Italian way but you can leave it out if you want). On a large square plate or board place one puff pastry square, add one third of the cream, top with a layer of coffee dipped Lady Fingers (place coffee in a large bowl and dip lady fingers one at a time). Top with another third of the cream on top place remaining puff pastry square and remaining cream. Refrigerate for at least 2-3 hours or even over night. Sprinkle with cocoa before serving. Enjoy! Hi Linda, I found these Italian ones (which I have used and I like them) on Amazon, maybe you could also find them in a store. They are Balocco Savoiardi Ladyfingers, hope that helps. This looks wonderful and I plan to make later this month. Can you please clarify the number of puff pastry sheets. It appears to be one sheet cut in half for a total of 2 pastry layers. However directions for baking pastry states “prick very well all four sheets”. 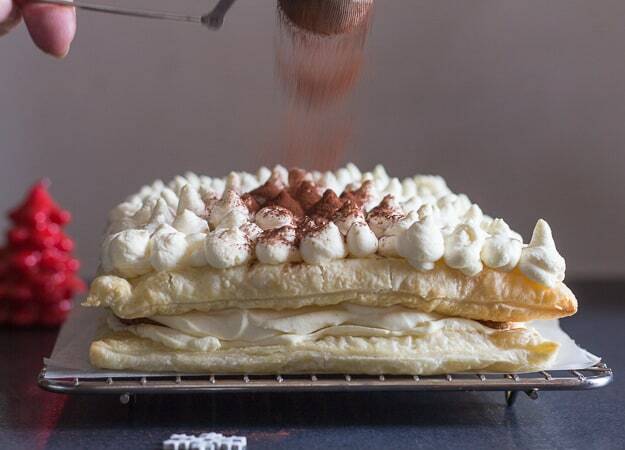 Hi Denise, yes it is 2 layers of puff pastry and 1 layer of lady fingers. Thanks recipe has been corrected. Let me know how it goes. I have just discovered your website and going to try the shortbread and able almond crescent before theNew Year. Iam delighted to learn there is a cook book coming… Thanks so much and Happy Holidays. Hi Mary, thanks so much, and hope you enjoy the cookies. Have a wonderful Christmas. This sounds delicious! My birthday is next month and I’d love to have this in addition to a cake. Hi Sandra, thanks so much I hope you enjoy it.